Democracy works by giving people a voice in how they are governed, and thus a say in their own future. 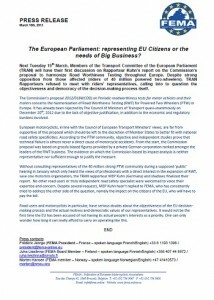 In the European Parliament (the directly elected assembly for Europe) your MEP represents you as an EU Citizen. There are over 750 MEP’s so to get anything done, they need to form committees to examine a particular topic – for example Roadworthiness Testing – and have that committee report back to them. The MEP who heads up the committee is called a Rapporteur. Rapporteurs are elected by fellow MEPs when one of the Parliament’s committees is assigned to draft up a report on a particular subject. The rapporteur’s job is to analyse the subject, consult with experts on the particular issue and with those who could be affected by it. These considerations become part of report they submit to the Committee. Because the rapporteur is an MEP, and because they are duty bound to take on board the views of experts in the field, FEMA, The Federation of European Motorcyclists’ Associations, requested participation in the discussions on Roadworthiness testing so that they could represent the views of riders from their member organisations (including MAG Ireland which is a founder member of FEMA). So FEMA, which represents riders needs to talk to the Committee and present the riders point of view as it typically would. Now meet Werner Kuhn, a German MEP & a Rapporteur responsible for steering the Roadworthiness Testing proposals through the European Parliament. You’d have thought that as an elected representative with a duty to listen to all sides, he’d be inclined to listen to the views of riders as expressed by the organisation which represents them – FEMA. You’d have thought wrong. 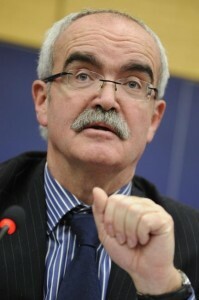 In fact, despite several requests including some from his fellow MEP’s in the European Parliament, Rapporteur Kuhn has to date refused to meet the FEMA delegation which has serious questions to put to the committee particularly in relation to the figures on which some of it’s decisions will hinge. We know that the figures being used were sourced from DEKRA, a testing company. Testing companies stand to make tens of millions of Euro out of any extension to the testing regime across Europe, and therefore have a vested interest in seeing the proposals brought in as law. It is the job of the MEP’s to listen to the citizens of Europe and to represent them. When MEP Werner Kuhn accepts the word of vested interests like DEKRA, while at the same time refusing to meet the only organisation representing riders from across Europe, it shows a distinct lack of respect for the democratic process. FEMA has today issued a press release (see below) calling into question the objectiveness and democracy of the decision making process. We in MAG Ireland have received the support of a number of MEP’s, notably Gay Mitchell and Liam Aylward and we will be taking this issue up with them and their Irish colleagues to ensure that your voice is heard at the heart of Europe. As things stand, the proposal faces strong opposition. Countries which do not have RWT for motorcycles generally do not want to spend millions introducing it, while those like the UK which do currently test don’t want to spend millions adapting their existing processes to meet the proposed new regulation. MEP’s across the EU know this. The European Council has already dismissed parts of the proposal, and would prefer to see a directive which would allow countries more flexibility for implementation. Ironically, it is the very dogmatic and uncompromising nature of the current proposal which may yet prove to be it’s undoing.